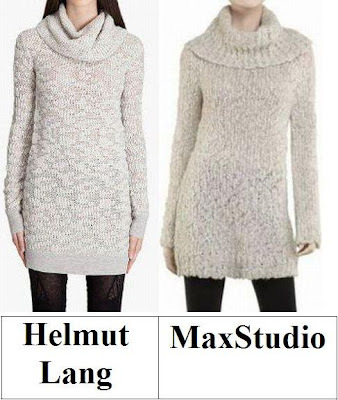 Lovers, to the left you will find le haute Turtleneck Sweater from Helmut Lang; on the right you will the classy Cowlneck Pullover Sweater from MaxStudio. Though the Lang lovely features a collar that is slightly more slouchy than the MaxStudio marvel, and is constructed out of a wool/nylon/mohair blend as opposed to the soft wool/nylon/acrylic mix of the MaxStudio; for a mere $58.00, in comparison to the $345.00 needed to take the heather gray Helmut home, it is the ideal way to add a luscious touch of winter to your wardrobe – on a cozy budget! Thanks to Ssense and MaxStudio for the pictures. MaxStudio actually looks more cozy. Ohh looks so comfy! I love big turtlenecks in the winter... it's freezing these days! I think Max might have the cozy down on this one. Oh please, sign me up for at least 3 of the Max. I have such a hard time finding sweaters in a long length. These look perfect. I think I like the Helmut Lang one better. I have definitely been trying to buy quality instead of quantity lately. i LOVE finding copy cats for cheap!! ;) thanks so much for doing the work for us!! thanks for your sweet comment on my awkward and awesome post!! So cozy. So nice to have. I like the cheaper one. I want a comfy warm dress like that! fab pieces! looks so warm right now as im sitting in 0 degree weather in ohio!!! I am a thrift addict but this is a classic and I would definitely save the money for the Helmut lang. The neck has a beautiful 'fall'. I know in 10 years I will be pulling this one out of my closet. if only we have winter here, i would buy the left one in a hearbeat! if only we have winter here i would buy the left one in a hearbeat! Both are so similiar I would go with the Maxstudio one. I love how your able to find such great deals each week. I am hoping that soon a great pair of wide legged jeans will pop up in your comparisons. hint hint. Oh Thrifty all the way!! I love Max Studio and honestly, $345 for a sweater is kind of a crime!! I think the slightly less quality fabric is more than made up for by the massive price difference! i'll be trifty today, the maxstudio sweater looks so comfy! So cute and amazingly similar! I haven't jumped on the sweater dress bandwagon yet but if I do I will check out MaxStudio! I like how the Max Studio sweater is a little looser than the Helmut Lang one, and I don't like to spend $300 for a sweater. Hope you have a great day, E.
i remember this helmut lang turtleneck-sweater dress. i think it fits much better than the less expensive version. I like the shape of the Lang, but the Max one looks cozier. Then again, considering the H. Lang dress isn't pure wool, I don't see paying the high price tag! Both look luxuriously cozy! I like the neck of the Lang better, but I'd go with the Max Studio for the price tag. Not exactly cheap but much cheaper!! Looks so cosy! Gorgeous! I have a similar one from Ted Baker! The helmut is just SO much more beautiful. I'd rather have none if I couldn't afford it! I buy all of my sweaters stupidly oversized in foul ludicrous colours from charity shops :) They're just so much more playful and I can always wear them as winter dresses with boots. I really appreciate price comparison posts, but personally both of these sweaters are staggeringly dull to me. This is gorgeous and looks SUPER cozy! I love. You have no idea how much I want to be wrapped up in that cozy sweater dress right now. It would be heaven! I can't even look at those sweaters! Today is 40ºC here in Rio de Janeiro! Definitely the Max Studio. I love big comfy sweaters like this with otk the knee boots, and leggings. It's so chic, and easy to wear. That's a great price for the Max Studio...I love it! Have to say I like the looser cut of the Max Studio one better. The other looks like it might ride up when I sit down. Not good! The Max Studio one looks kinda bulky so I'd go with the Helmut Lang! I have a sweater similar to this and it is so so cozy. I highly recommend getting one! this is right up my alley--long and comfortable--and the MaxStudio price totally speaks to me. So love the thrifty one. The Max studio sweater is hawt! I like! I love the warm dress. and max xollection is awesome . amazed again, you find such similar items! I will go with the Helmut one because i looks like it has better shape! Sweater dresses are perfect for this kind of weather. I definitely love the Helmut Lang one. I prefer the neck on it. Who doesnt love to put on a nice, big cozy sweater! Love the grey color. Happy Weekend and Valentine's Day! It reminds me of the grey sweater I wore yesterday! But mine has 3/4 length sleeves. I think I will forgo either of them for that reason. But again, Erika - you have a knack for finding fashion on the cheap!! i wish my weather would allow me to wear this sort of turtleneck ! I think I might just have to splurge on the Helmut Lang this time!! I like both actually, and they look really similar, so I would not mind either.